On second thought, maybe USF should have declined its invitation to a bowl game. It wasn't worth the embarrassment. 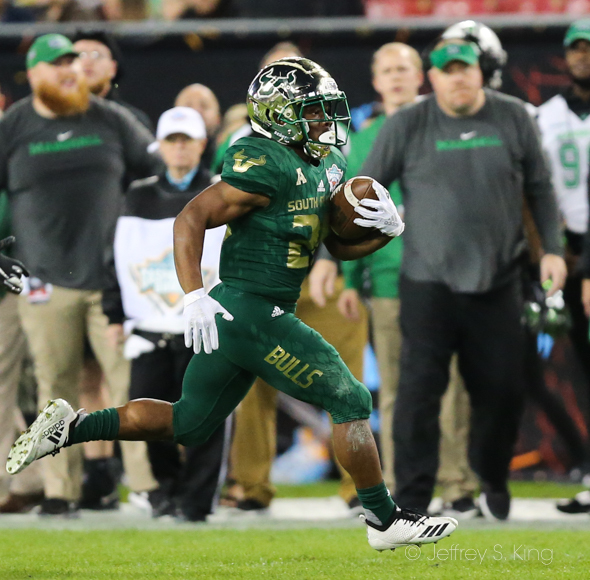 The Bulls wrapped up one of their most disappointing finishes to a season Thursday night, losing badly to a smaller school from a lesser conference on its home field. It ended up 38-20, and it wasn't that close, and it completed the team's collapse. Marshall had 503 yards of total offense. It was like watching a football team climb halfway up a mountain and then fall off of a cliff. The Bulls won their first seven games this year, then lost their last six. No college team has ever managed to fold so completely. If there is anything that irks the USF faithful, it is losing to a team that is considered a lesser opponent. 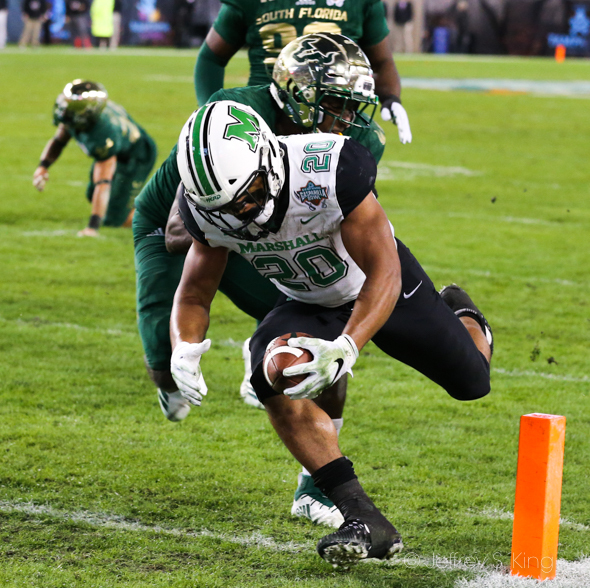 Marshall, from Conference USA, ran over a poor tackling Bulls team on its way to the win. The Thundering Herd finished the night at the USF eight. By that point, they had all the points they needed. Nothing seemed to go right for USF. Not the decision to start quarterback Chris Oladokun, who didn't move the team in two series. Not the decision to bring in regular starter Blake Barnett, who was sacked on his first play and saw a snap go over his head on the second. Not the decision to go for a field goal on a fourth-and-goal from the nine while trailing by 21 points. Nothing. 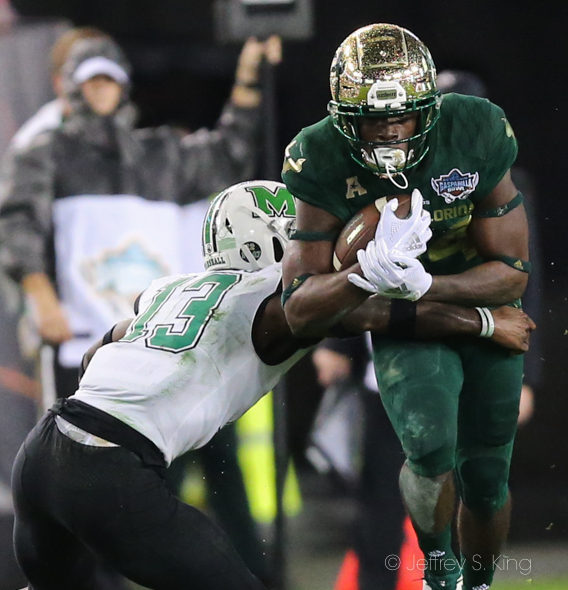 In all, Marshall ran for 282 yards in its win.They averaged 6.4 yards per run (USF averaged 2.6). Keion Davis had 94 yards and Brenden Knox had 93. 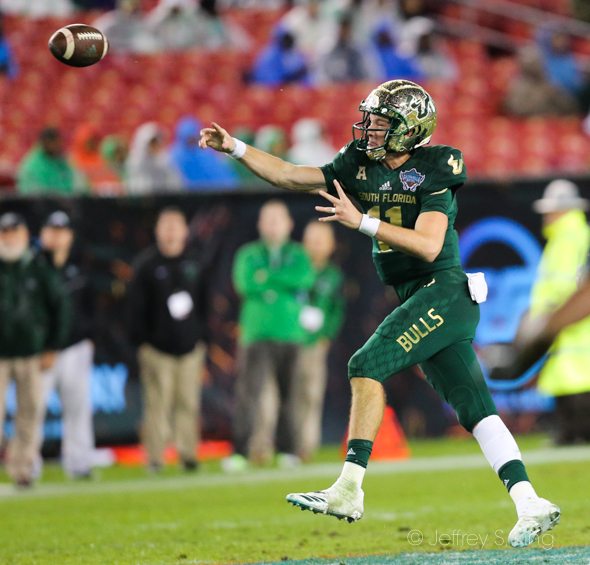 If the designation helps, USF completed an unprecedented collapse to its season. No team has ever won its first seven and then lost its next six. Texas Tech, in 2013, won seven in a row to start the season, then lost five in a row. The Raiders, however, won the Holiday Bowl over Arizona State to finish with something. The Bulls went their last two months without winning. "It's really tough to start out the way we did," said USF coach Charlie Strong. "I hate it for the seniors. They've done so much for the program that you wanted to go out and just win this game and just stop the slide and win it for them. But when you don't tackle well, you don't execute, you don't play well, that's what happens." 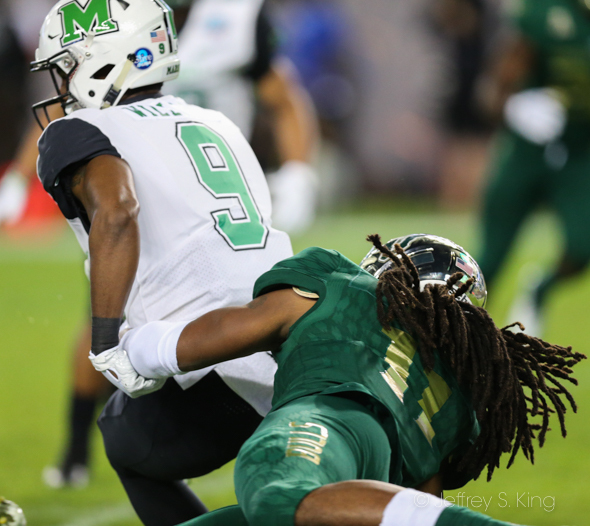 USF allowed 33.7 points per game in its losing streak. The question going into the off-season is that if the team had played the way it finished throughout, would it have won at all? The Bulls were out of rhythm for the entire night, and they barely moved the ball on the ground. In 11 carries each, Johnny Ford had 50 yards and Jordon Cronkrite -- one of the nation's leading rushers for a while -- had just 26. 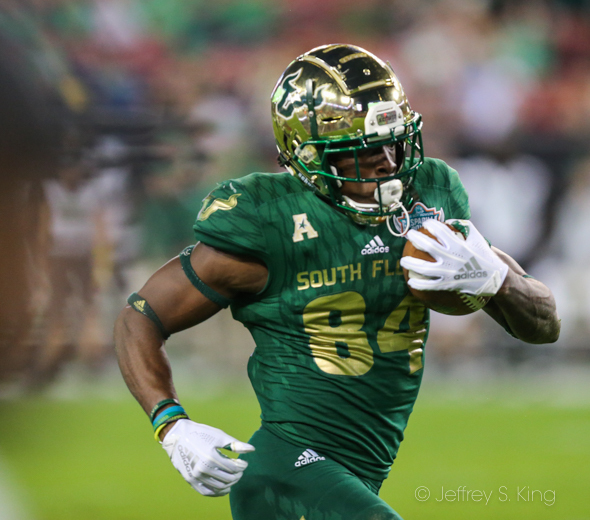 For USF, the standout was receiver Randall St. Felix, who caught six passes for 165 yards and two touchdowns. Strong defended his decision to go for a field goal late in the first half because the Bulls would get the ball to start the third quarter. They had a field goal on that drive, too. "I didn't want to leave out of there with no points," said Strong, "So it ended up being 21-10 (actually 28-10), then we get the ball to start the second half." That didn't work either. For the last half-dozen games, very little did.